So this is it week 15: RACE WEEK!!! This week you’ll be out on a different road with different people handing you water and gatorade. Remember this is just another long run, just a bit longer. It’s really a bunch of small runs, say 7 runs that are less then 4 miles. No problem. You’ve done 6 of them before and that went fine. The big difference is that after the 7th run you’ll get a medal, a shiny blanket, and the extreme honor of finishing another marathon. So get out there and do it! For the rest of us, no real run planned this weekend. I may not be in the area, I’m not sure yet, but if people are running and I am around I’ll try to meet you in the middle somewhere and run a few miles. Feel free to use this space to coordinate this week, then hop to the forum if you want to keep it going further into the fall. One last piece of business. What are the marathon plans going forward? I ask because we need to start planning the post Fall ’13 Sunday Long bRUNch. Every season, on a week where the least number of people are off running a race, we like to get together and celebrate the accomplishments of the year. To do this I need a volunteer to host the brunch. All you need to do is clean your house, have us come in with tons of food and beverages, and then clean whatever we leave behind. Its a pot luck kind of brunch, the host brings nothing, the guests bring everything. That too will be coordinate once we figure where and when. So who’s interested? That’s it from me this week. So last week wasn’t as easy as it should be. With less than 15 miles to run, Mother Nature decided to challenge you a little. I guess this training season hasn’t toughened you up enough, she has a way of making sure you’re ready. The run started with a drizzle and temps in the mid-60s. By the time runners hit the first water stop there were downpours and they lasted until the second water stop. As the rain wore people out, Mother Nature decided to test you even more by lowering the temperature to the mid-50s. The good news is everybody passed the test. Runners were cold and weary but they finished. Hopefully this week goes a bit easier. This week’s course is the same 12.5 miles that we ran in week 2. Here’s the good part though, its going to seem soooooo much easier! We’ll start out Main Street going North up to Ell Pond. Give the Clarence DeMar monument a little tap, from one great marathoner to another. Then turn left on Melrose St down to a left on the Lynn Fells. Follow the Lynn Fells onto the Fellsway East to Highland Ave. Take the right and head up to the water stop. Come talk to me there and tell me how much easier the hills feel now that you’re all well trained. Out of the water stop, here’s where things get crazy! Everyone go straight past the hockey rink, long and short runners. Short runners will turn down Pond Street to Wyoming and finish up a nice short run ready to run a half next week. The longer runners will loop Spot Pond counterclockwise. Yes, crazy isn’t it?! You’ll see the pond a whole different way this way. Especially when you run up Elm St to turn right on Highland back to the water stop. From the water stop you’ll head over to East Border Road, chug up a hill where you’ll be less likely to want to swear at me because this all seems easier now that you’re in tip-top shape. Left on the Fellsway through a couple more hills and then take a right when you hit Grimsby’s. Go down West Wyoming and left on Main Street and voila you’re back at Brueggers with a surprisingly large amount of your Sunday Morning still ahead of you. Water Stops: I’ll be out there. I may run a bit but I’ll have Highland Ave taken care of. If anyone wants to head over to Straw Point and provide some snacks on the other side of the pond, just let me know. You can meet me at Highland and take some supplies over. Good luck to all that are actually running their half marathon and marathons down in Hartford as I type this! And anywhere else in the world you might be challenging your running abilities this weekend. Go get ’em people, you’re ready, willing, and able!!! Roll Call, who’ll be in for this weekends run? Week 13 – Tapah Time! If you ran your longest run last week, well its time to recover from all those miles. Yes its time to taper, or as I like to call it “Don’t do anything stupid time”. Yes, the training isn’t over, but lets not push your muscles to hard as we wrap things up over the next few weeks. This week we have a nice little 14.8 mile run on tap. Yes, what 10 weeks ago would have seemed like a quite a challenge is now the easy run. 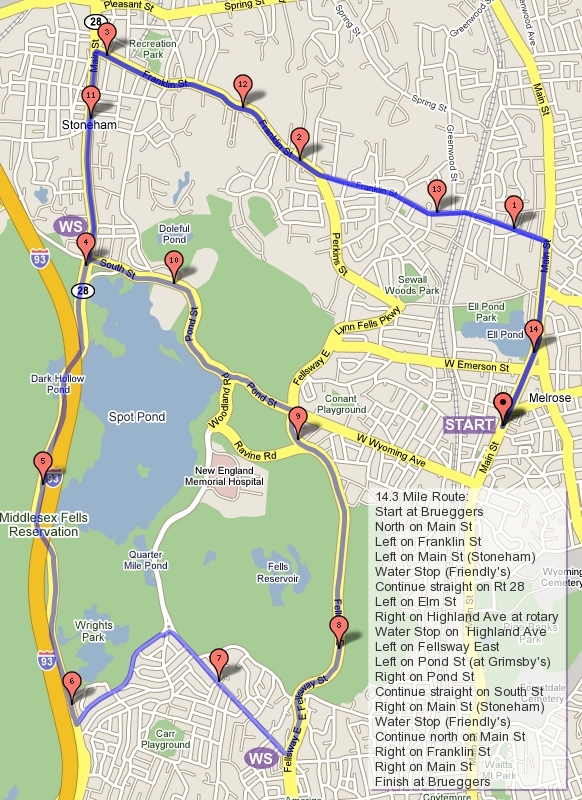 The run will take you up East Foster to Melrose Common, then over to Swain’s Pond Ave, and through Malden with a right on Lebanon and left on Forest St. At the end of Forest you’ll find water stop one at Citizen’s Bank. After the water stop you’ll run out on to Winter St, past Oak Grove, through a complicated intersection where you go straight across to Glenwood Street. Follow that up hills and around corners until you hit the Fellsway East. Turn right there and go find some more hills as it brings you to the LynnFells Parkway which will take you to the knoll at Melrose High School where you’ll find the next water stop. If you’re looking to run shorter than 14.8 you have the choice to turn before the water stop at Grimsby’s for something in the 7 mile range or after the water stop for an 8 mile run. For those going long keep heading up the LynnFells Parkway until you hit Saugus. Turn left at the lights at Main Street in Saugus and keep your legs moving through some more hills to Farm Street. Take a left at Nahant and pop out at Main Street in Wakefield. There’ll be a water stop at Nick’s Pizza. From Nick’s head south on Main Street and finish up at Brueggers. Nice simple run as you start to ease your way through the taper. Water stops: I’m back so I’ll try to handle them. If anyone wants to help out a car at the knoll will help ensure I get to Nick’s Pizza on time. I can pick someone up there if they are willing to leave their car there. Regarding supplies, if you have some and are running I’ll just pick them up Sunday Morning. If you have some and you’re not running drop me an e-mail and I’ll try to pick them up from you.